Two eggs from a pair of endangered birds of prey have hatched on a tower block in central London. 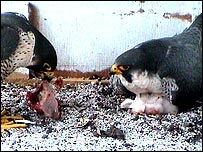 The Peregrine Falcons laid three eggs in Marylebone, where they are being monitored by the BBC's Springwatch. This is the second year the birds have nested in the same spot. Last year they successfully reared two chicks. "Clearly they have identified tall buildings in London as a great place to live," said Andrew South, of the Royal Society for the Protection of Birds. "And that has a lot to do with good food sources." Peregrine Falcons can swoop on prey at more than 200mph and are often described as the fastest birds, if not animals, on earth. Many were culled during the two World Wars to protect carrier pigeons and by the 1980s, the breed almost vanished from the UK - but now there are about 1,500 pairs. They are usually seen in coastal regions with high sea cliffs and wild, upland crags but the birds are adapting to city life. Mr South added: "This is fantastic news as these birds are in good recovery but they are still the most protected bird in the country." The chicks hatched on Wednesday and Thursday and a third is expected any time in the next few days. They are being watched around the clock by Royal Parks staff, advised by the Metropolitan Police. A watch point will be set up in Regent's Park so people can watch the chicks' progress until they leave the nest in about a month's time. Dave Johnson, the Royal Parks' wildlife officer who has spent 1,500 hours monitoring the birds said he was "thrilled" to see them back. "Last year they successfully raised two chicks but the parents would not have returned if the site conditions were not right," he said. The birds are to be featured on the Springwatch programme next week.